In several recent meetings, the topic of which size customer segment to pursue first has been a key part of the discussion. Do you start first with small/medium businesses (SMB) and then work up to large Enterprise customers? Do you focus first on getting a few Enterprise reference customers? Or do you aggressively target both segments? While there is no right answer for every situation, here are a few things to consider. There are several advantages to starting with SMB. First, you typically have shorter sales cycles which allows a startup to get more paying customers faster. Second, their required “feature/function” set is usually less than enterprise, freeing you from contracts that have build-out requirements included and allow you to sell a more basic product. This also allows you more opportunities to test/tune your product before taking it to large reference-able customers. Another advantage is SMB customers are usually more willing to take a risk on a smaller vendor and provide meaningful feedback. The major challenges of SMB is they often have less budget to pay for solutions (i.e. lower realized price point), typically have higher churn than Enterprise, and can often be just as difficult to implement and support (if not more). Note, in some markets small is very different than medium businesses, but for simplicity am grouping them together here. There are several advantages of starting with Enterprise. First, getting Enterprise customers allows you to reference established brands, further giving your startup credibility and making future sales easier with the credibility of a large reference customer. Second, Enterprise typically have more budget to pay for solutions. Another advantage is Enterprise customers typically take longer to churn (often a result of a more complex/custom implementation and internal challenges to change). The major challenges of Enterprise are longer sales cycles, often high development for certain table stakes feature/functions, potential to be purchased but not fully implemented, and the risk of being steered off your vision by one large customer that wants a lot of customization in their solution. 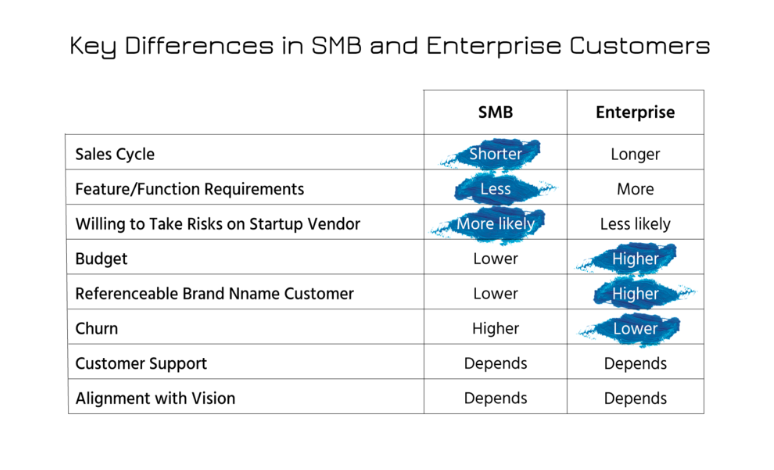 See below for a summary of some of the key differences in SMB and Enterprise customers. Note these are all looking at the segment as a whole; individual company differences may vary and the nature of your product/service can also make a difference. As you can see, there are pros and cons to each approach. I think the question to ask is: in which segment can you maximize the advantages and minimize the risks. For example, if you have a connection to a large enterprise customer that is aligned with your strategy and will not require lots of additional development work and support, go for it. If you feel the advantages of getting lots of customers quickly at lower price points outweigh the churn and implementation challenges, go for it. Rather than going after both segments right out of the gate, I would suggest picking just one target segment, and being opportunistic in the other segment, so long as those opportunities fit within your strategy and come with minimal risk/distraction.